Archivist love to tell us to digitize our photos. They tell us to write them to CD or DVD. They point out that digital photos can be reproduced exactly with no loss of quality. But those medias begin to degrade and drop bits in just 3 to 5 years. 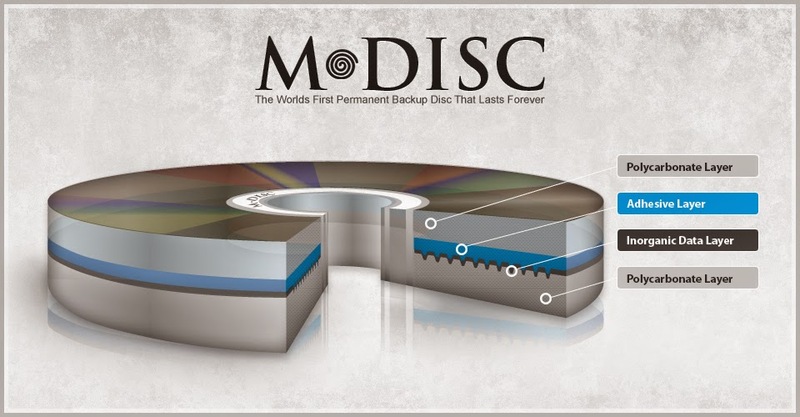 The M-DISK is here. A M-DISK recorder will let you archive your photos on a new type of disk that will last for 1000 years. You can play them on any DVD or Blu-Ray player. Compare that to Kodak Kodachrome Slides. Kodachrome slides last much longer than other types of color film. They lose 20% of their color every 184 years. That is,,, If they are stored in perfect conditions, (cool, dry and dark). At that rate, they will be unusable 920 years. If you project one Kodacolor slide in a modern projector for a total of ONE HOUR the slide will be unusable. That is the same as projecting it for one minute, every Christmas for 60 years. The M-DISK DVD has the Kodachrome slide beat for storage longevity. What about longer than 1000 years? Slides and photos degrade at some constant rate. If you made a copy every 10 years, the original has degraded, so, the copy starts out already degraded. Instead of extending the life of the image, you shorten it, because the copy is not a perfect reproduction of the degraded original. You can make exact copies of the ones and zeros on the digital M-DISK. In theory, you can reproduce exact digital copies forever. So, your media will last 1000 years, but how do you view it 1000 years from now? Do you really think you will be able to find or buy a DVD player twenty years from now? How about 100 or 1000 years from now? You can store slides for several hundred years, and you can still see the faded image, but, can you view them 100 years from now? You can still find projectors on ebay, but the projector lamps are no longer made. The technology lifespan of the Kodachrome slides was from 1936 until July 14th, 2010 when the last roll was processed. The physical DVD-BluRay disk sales reached a peak in 2004. By 2014, sales had decreased 30%. Do you really think you will be able to find or buy a DVD player twenty years from now? How about 100 or 1000 years from now? Try to buy a VHS video recorder, or a PC with a Floppy disk. Each replacement technology has a shorter lifespan. Most of us now store our photos on memory sticks or USB hard drives. The USB standard will not last forever. Intel tells us that all new external devices will be wireless in the next year or two. Which image will last the longest? The answer in my next post. My parents blame me that I've payed someone to write my research paper for me. Family relationship is falling down because of this. What do you think?